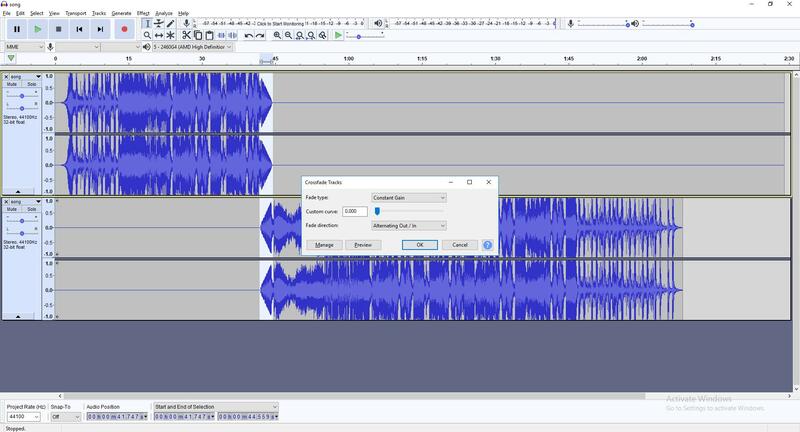 It’s recently come to my attention that this tried-and-true method for cutting long and repetitive songs down to size is not as well-known as it should be in the community, so here’s a quick tutorial on using Audacity to apply a cross-fade to mask a cut. 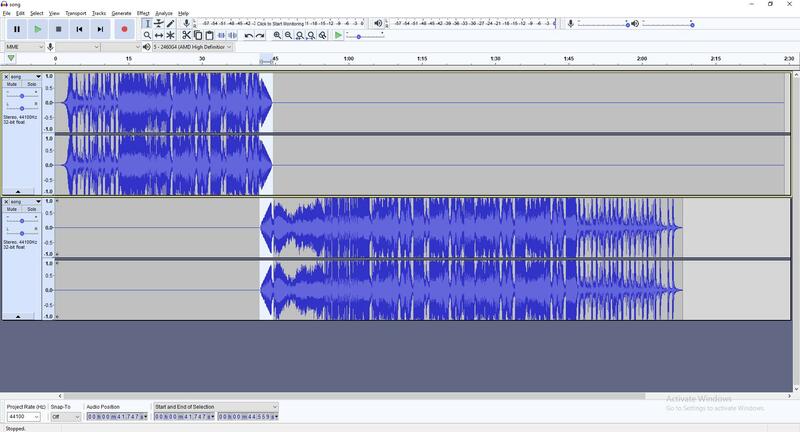 For those who don’t know, a cross-fade is when one audio track fades out while another simultaneously fades in. By cross-fading two similar sections of a long song, you can cut a middle section without any detectable popping or other such noise, and it aligns with the tempo of the song more reliably than a hard cut to boot. There’s a companion video below, if pictures don’t do it for ya. 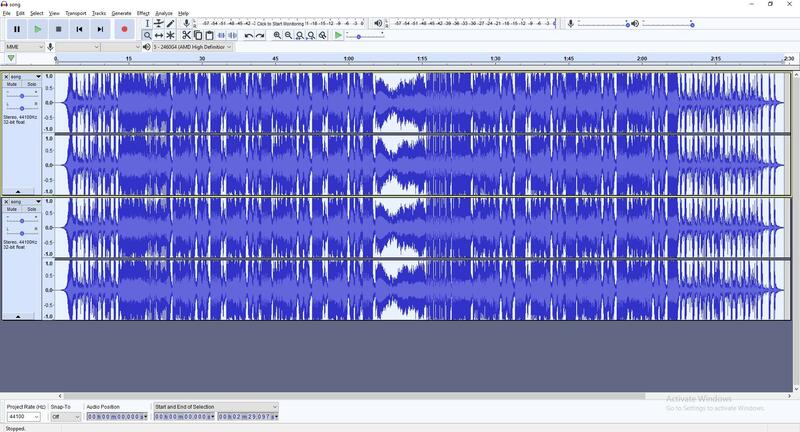 Open your song in Audacity. I’m using a track from one of AaltopahWi’s lighting ventures in the linked video, And Or Not, since I just received it today and I happen to know it’ll illustrate this technique well. 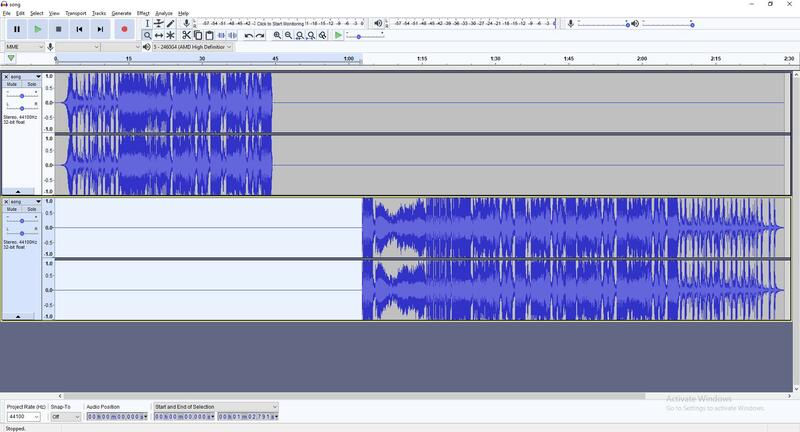 Duplicate the track (the entire song should be on one track) so there are two identical copies of the song on top of each other. On the top track, select a region starting at the end of the first instance of your matching clip and ending at the end of the song; silence the entire segment. On the bottom track, select a region starting at the beginning of the song and ending at the start of the second instance of your matching clip; silence the entire segment. 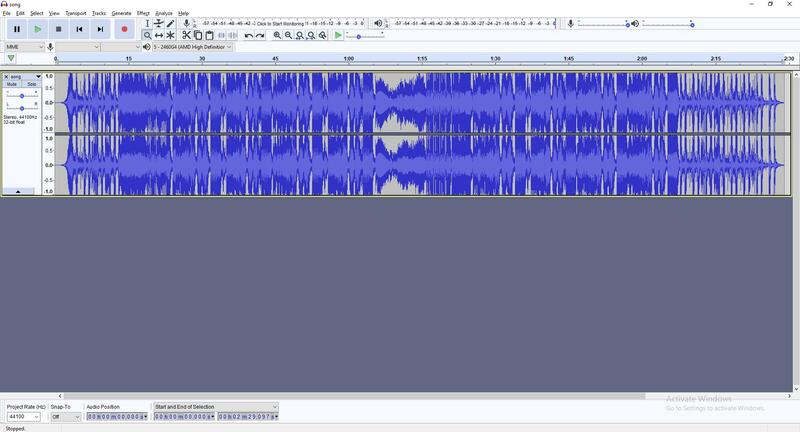 The last few seconds of track one are now identical to the first few seconds of track two but from different sections of the song, and the adjoining section has been removed. Use the time-shift tool to drag the bottom track left until the two matching audio clips are overlapping. If you zoom in extremely closely, the waveform will be replaced by a series of lines/dots indicating the peaks and troughs; use these indicators to line up the two tracks perfectly. If the song is electronic like our example, this should be very easy. The more natural your recording, the more difficult it may be; it’ll still work, though, and since the risk for audible artifacts from hard cuts is so much worse in meatspace music, the benefit is actually much greater. Listen to the overlapping area to confirm a match. There will likely be a lot of peaking/noise since there are two full-volume copies, but we will deal with that – just make sure there’s no echo/offset from misaligned tracks. Select the overlapping region across both tracks. You may need to set “Fade direction” to “Alternating Out / In”, since “Automatic isn’t super reliable. This indicates which track to fade out and which track to fade in. Listen to the overlapping section again. If all went well, you should have a perfectly blended transition between the two tracks. Trim the silence from the end of your newly combined track. 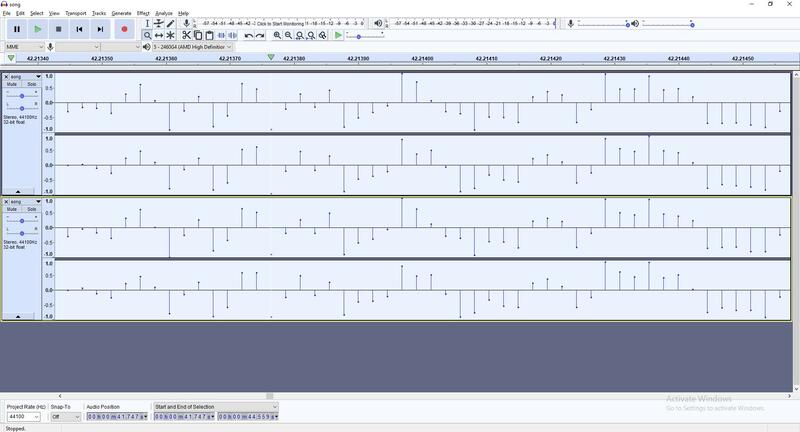 While you’re in here, line up your audio to a click track at the appropriate tempo to minimize the need for an offset in your map editor. 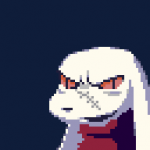 You’re done! Export to .ogg for Beat Saber use! Pro-tip: every time you upvote a map, an angel gets its wings.